wandeln (German) verb. to walk, also to change or convert. wandeln is a site specific sculptural work I have created for the Lustgarten (pleasure garden) project of Barbara and Rudolf Beisinghoff in the town of Rhoden, Germany. Their intention in restoring the historic garden (which dates back the 1650’s) is to combine nature and art in the form of an artist’s trail or Kunstpfad incorporating not only the Lustgarten itself but the nearby palace and Holpergrund forest as well. 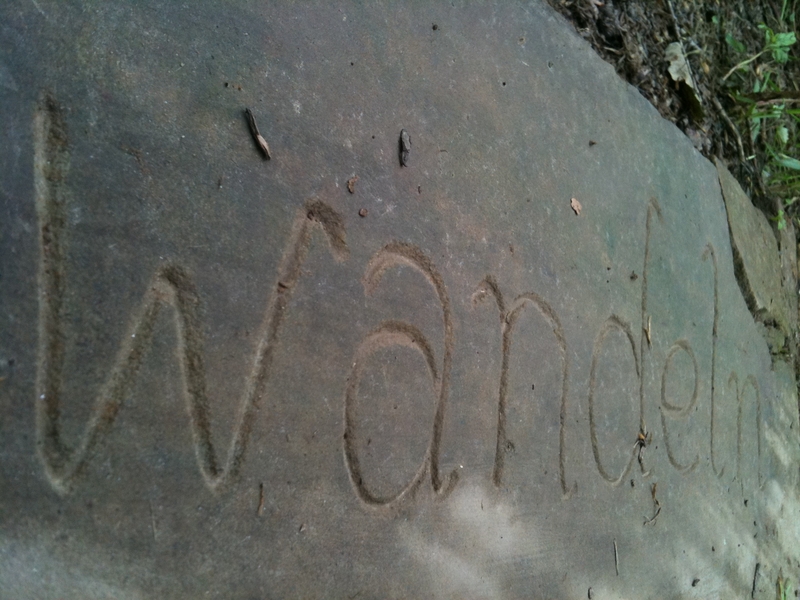 The text wandeln is carved into a paving stone of local sandstone located on a pathway leading from one of the main entry points to the Lustgarten and is intended to be discovered by the viewer. The work can be seen from the entry point to the hidden garden although it is deliberately unobtrusive and may at times be partly obscured by grass or leaves. This is in part because of its situation on the ground but also because it is incorporated into an element of the landscape rather than sitting outside of it. Because the work is set into the ground the viewer must slow down and perhaps even come to a complete stop in order to read and understand the text. This deliberate slowing of pace is intended to bring the viewer towards a more peaceful and calm experience of the hidden garden. When pausing to read the text inscribed in the paving stone the viewer must bow their head as if in prayer or reverence, thus further adding to the feeling that one is entering a special place. The physical act of bowing in response to wandeln makes the viewer a part of the work itself, in a sense they have been changed by their experience of the work and become part of it. 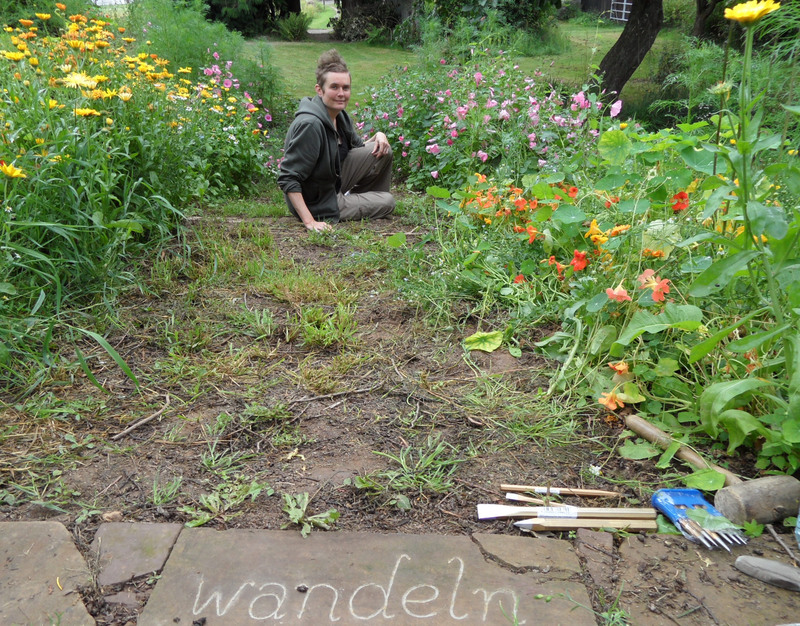 As an element in the Kunstpfad (artists trail) wandeln is an important choice of words because it means not only to walk but also to change or convert and the hope is that people who enter this garden will be changed by their journey through it. The artist with the work in progress. ← At Arms Length: conceptual framework for a print folio.